We're using a lot more local artisan companies in our designs this year! Our beautifully unique creations are overflowing with sweet & savory scrumptious treats, all artfully designed! Nothing beats a beautifully designed gift basket arrangement hand delivered to your corporate clients, friends or family in the Dallas Fort Worth - DFW Metroplex! Spectacular Christmas gift baskets to celebrate the Christmas season! The holidays are a great time to show your valued clients just how much you appreciate their business. To let family and friends know just how much you care. With just one phone call or online order, you can complete your holiday shopping in a matter of minutes for business, family and friends! We take the hassle out of the holidays so you have time to enjoy each and every moment during this special time! NOTE: Many of our regular everyday designs can be decorated with a holiday touch, like for instance, our thank you designs. Just let us know in the Special Instructions box at check out. 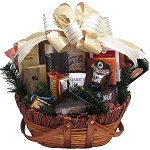 Gift baskets to be shipped will be designed lower in the basket and a smaller bow will be used. The peanut tins made in Dallas are no longer being made. We will substitute with items that are equal or of great value.